Don’t worry… I’m not going anywhere… this is a sports post. 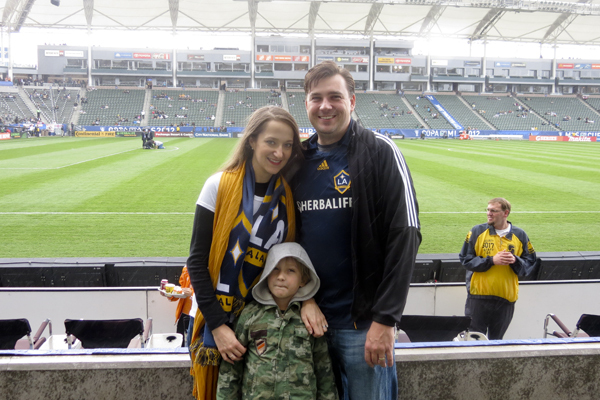 We spent Saturday afternoon at the Home Depot Center for the 2012 MLS Cup where we watched the LA Galaxy take on the Houston Dynamo. David scored some awesome seats in the third row and we had an absolute blast. There is nothing quite like watching a professional soccer match, not to mention a championship; we may not be the English Premier League, but the MLS is growing (there were tons of celebrities at the game like Victoria Beckham, Ryan Seacrest, Jeremy Piven, Dwight Howard, Kobe Bryant, Steve Nash and BJ’s favorite actor, Gerard Butler). 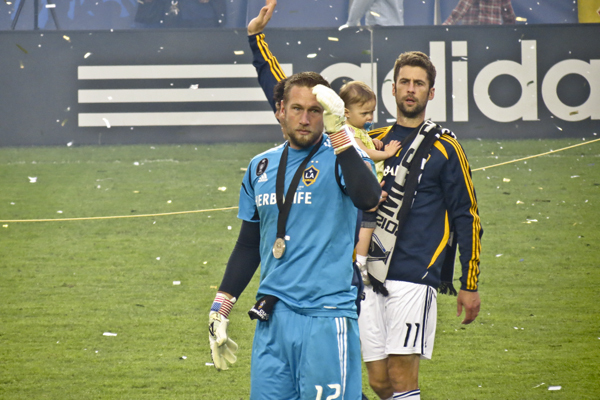 The game was bittersweet because it marked the end of the Beckham era in LA. Not only that, it was the last time we’ll see David Beckham, Landon Donovan and Robbie Keane on the same team. 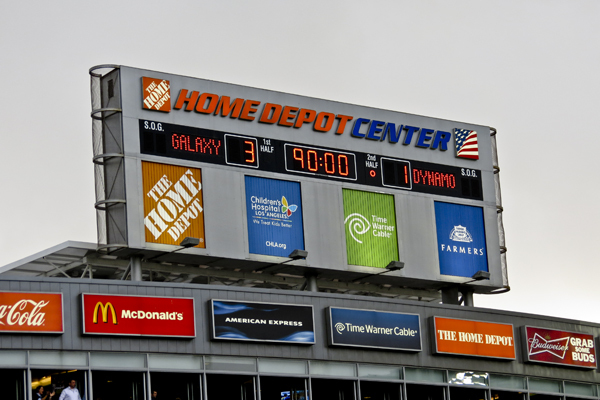 But let me tell you, they went out with a bang, beating the Dynamo 3-1. What made the game especially memorable was the fact that I got to watch it with my oldest son who is a diehard soccer fan (it’s in his blood… his daddy is Hungarian and I have yet to meet a Hungarian that doesn’t love soccer… and his mommy played soccer in high school… how could he not love the game?) 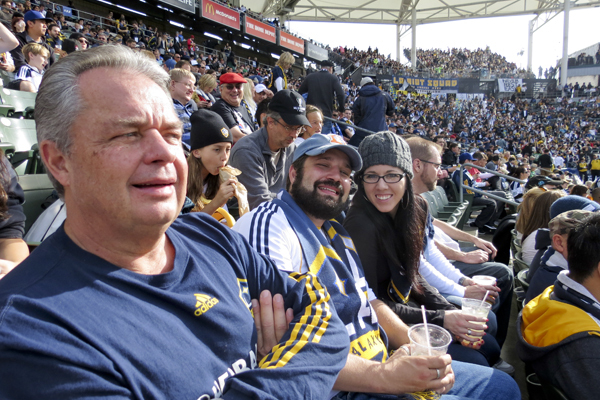 and he was over the moon to see his three favorite soccer players (Beckham, Donovan and Keane… in that order). It was also entertaining to see all of the farewell Beckham shirts (my favorites were the ones that read, “Beckham, take me with you” and “I hate to see you go but I love to watch you leave”). 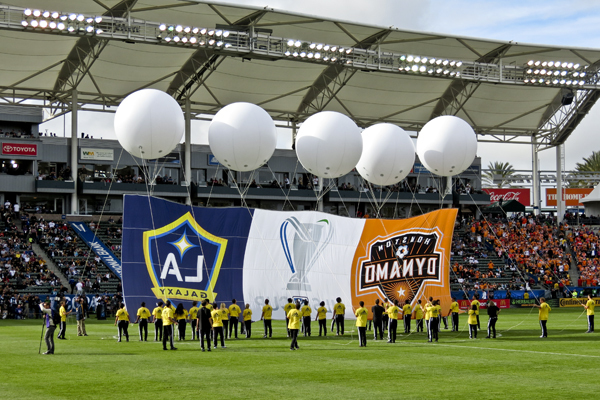 One thing is for sure… Stateside soccer is more popular today than it was before David Beckham joined the Galaxy, and more people watching soccer is always a good thing. 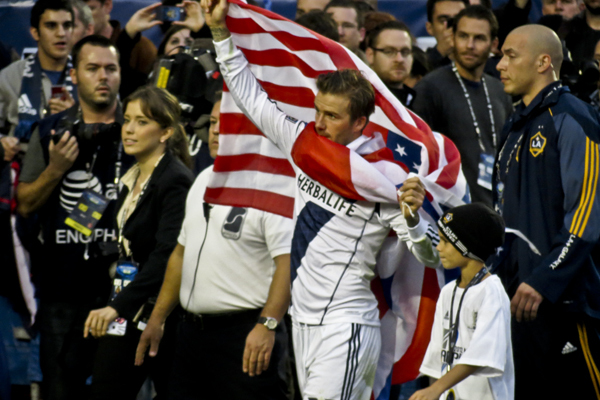 So, Mr. Beckham… So long, and thank you for the memories. Robbie Keane (right) warming up. 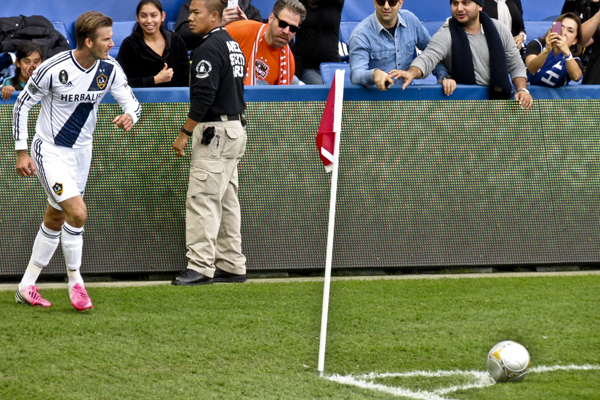 Beckham demonstrates why we have the phrase “Bend it like Beckham.” No one takes corner kicks like he does. 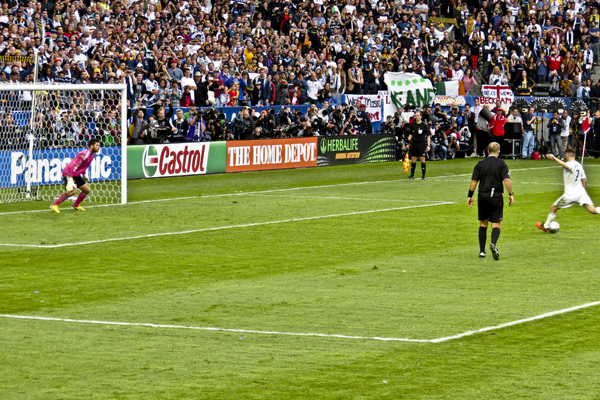 Robbie Keane as he scores the final goal. The crowd went nuts. 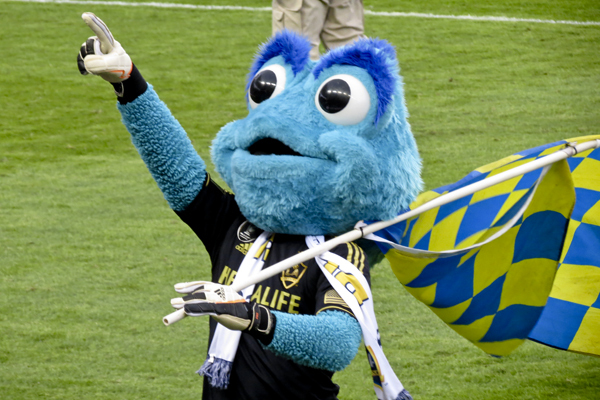 Cozmo kept the crowd pumped up. 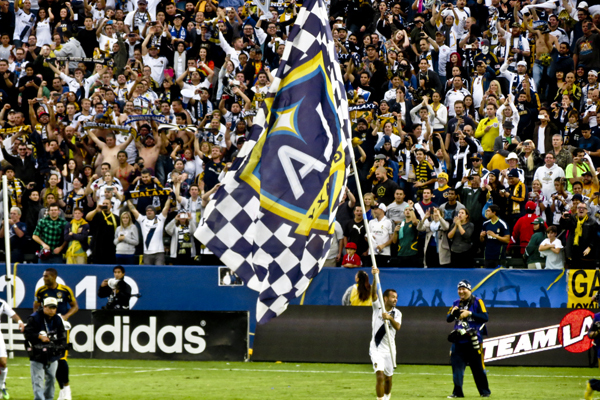 Juninho waving the team flag. Beckham’s sons had the cutest jersies that said “Daddy” on the back. 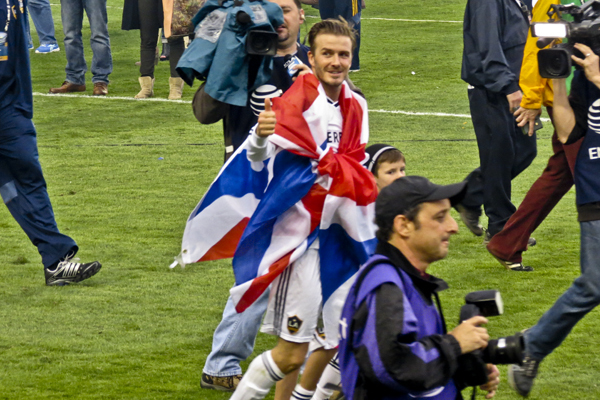 Beckham makes his way around the stadium one last time. 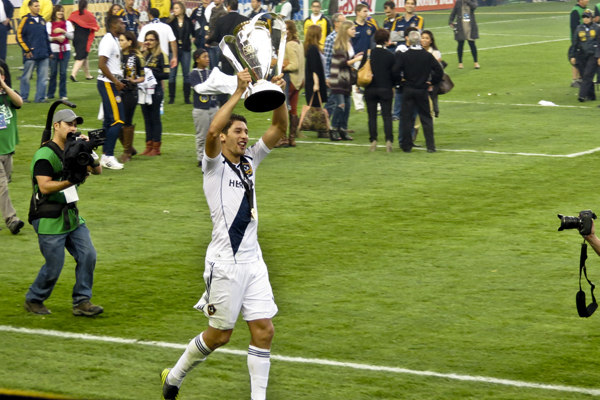 Landon Donovan kicks around the ball as part of his celebration.